Bathroom showers can deliver a face-full of potentially pathogenic bacteria, suggests a surprising new University of Colorado at Boulder study. The researchers analyzed 50 showerheads from nine cities in seven states that included New York City, Chicago and Denver. They found that nearly a third of the devices harbored significant levels ofMycobacterium avium, a pathogen linked to pulmonary disease that most often infects people with compromised immune systems. The also found that some M. avium and related pathogens were clumped together in slimy biofilms that clung to the inside of plastic showerheads at more than 100 times the background levels of municipal water. “If you are getting a face full of water when you first turn your shower on, that means you are probably getting a particularly high load of Mycobacterium avium, which may not be too healthy,” said study leader Norman Pace. Symptoms of pulmonary disease caused by M. avium can include tiredness, a persistent, dry cough, shortness of breath, weakness and fatigue. The study, appearing in the Proceedings of the National Academy of Sciences, is part of a larger effort by Pace and his colleagues to assess the microbiology of indoor environments. 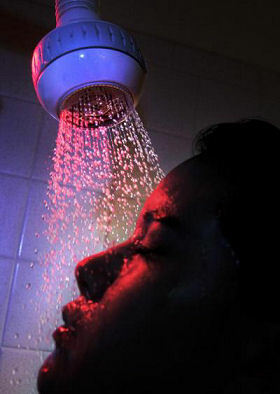 Pace explained that showerheads provide a unique dispersal mechanism as pathogen-filled droplets that suspend themselves in the air can easily be inhaled into the deepest parts of the lungs. One showerhead in the study with high loads of the pathogen Mycobacterium gordonaewas cleaned with a bleach solution, but later tests on the showerhead showed the bleach treatment had actually caused a three-fold increase in M. gordonae, indicating a general resistance of mycobacteria species to chlorine. Should we give up on showers? “Probably not, if your immune system is not compromised in some way,” said Pace. “But it’s like anything else – there is a risk associated with it.” He suggested that since plastic showerheads appear to “load up” with more pathogen-enriched biofilms, metal showerheads may be a wise alternative.